Forum Index > Off-topic Talk > Settlers Day 2008: Inviting you to join us in Manville! Posted: Wed 06 Aug, 2008 1:22 pm Post subject: Settlers Day 2008: Inviting you to join us in Manville! There are numerous activities that include the boom range and demonstrations. 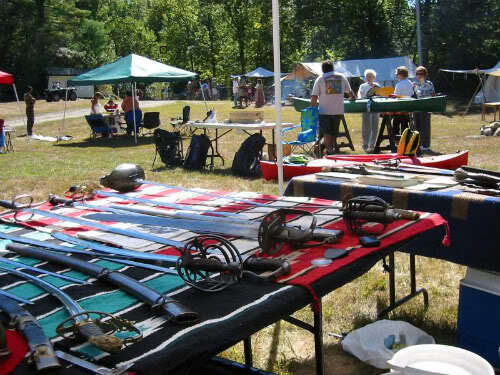 For several years now, Glen Cleeton and Todd Pelletier have been operating a tent with swords on display for the enjoyment and education of the general public. From year to year Glen and Todd have been joined by members of this and other forums, many of whom have contributed to the selection of weapons exhibited. On display are swords and knives from well-known smiths and manufacturers such as Arms & Armor, Del Tin, Windlass, Hanwei, Oscar Kolombatovich, Kevin Cashen, and Vince Evans. Additionally there are antique military swords from as early as the 1740s and as late as the early 20th century. We would like to invite members of the forum to join us at Manville this September. If you are interested being a part of the exhibit in the tent, please contact me via PM and let me know what you would like to bring for display. If you would like to stop by and visit, we would be happy to meet you and talk swords! Please reply here if you are going to stop by. This is an event that has gone through some changes and last year showed a bit of a revival for the club's promotional efforts and outside participation. The local Pennacook folk have returned with a pow wow, up the trail from the main field. The tents in the background of the second shot are militia and settler re-enactors. There is some onsite food, live music and activities. Cowboy action guys, hawk throwing and fun for the whole family. Admission is free, some hands on activities and the food are the dollar ticket routine. The club does not have a flyer up yet on their site but I would expect something soon. There are some more photos of past years here, I never seem to take as many as I could. We're still about a month out from this. If you plan on coming, the parking is a little odd in that the main lot is a couple of blocks away from the club itself. There are shuttles from that point. if you are planning to bring sveral pieces, please notify Jonathan or myself so that we can let the guys with the vests know to let you drive right on in. I didn't know you guys did this at Settler's Day. Where the hell have I been??? I'll definitly be there. Can't wait. It's always great to meet more forumites and we'll look forward to seeing you there. There is also usually some cutting going on but we misqued somehow last year and had only a few zuchunni to go around. Playful but not much to them. I hope to have at least some back-up material and need to gather it together. The focus has changed a bit as well, more original stuff to discuss with folk. Last year there was a lot of sharing books with each other and just general sword banter. Some non sword folk had actually found old forums announcements when looking for information on the web about the club's event. It is certainly nothing like a full blown fiare or fair but a nice local event that has provided an opportunity for sword folk to have a get together. Not quite centrally located to New England but managable for many. The event is family friendly, so if such a day trip fits in with any clan's plan, stop on by. Just a week out from this now. All systems are still go. I had already started packing stuff up a couple of days ago. More books this year as well. The weather forecast is looking dry but cool and mostly cloudy. in the fifties on Sunday. One last huzzah for this announcement. It appears as if it will be a damp one but what else would we expect from New England weather? Sunday may be the drier day but I won't be at all suprised if it gets sunny and eightyish tomorrow afternoon. Jonathan has cancelled due to circumstances beyond his control but We will be there. A true adventurer, who drove down from Vermont last year. I'm headed down that way in a few hours. Pop-ups and table space can be added as needed. Reserves were called in but it looks like we may not need them.